A new mouse model of ALS may help scientists elucidate the earliest stages of the disease. The knock-in mouse, developed by Elizabeth Fisher and colleagues at University College London in England, exhibits key signs of ALS including motor deficits and progressive motor neuron loss. Aggregation Not Required? 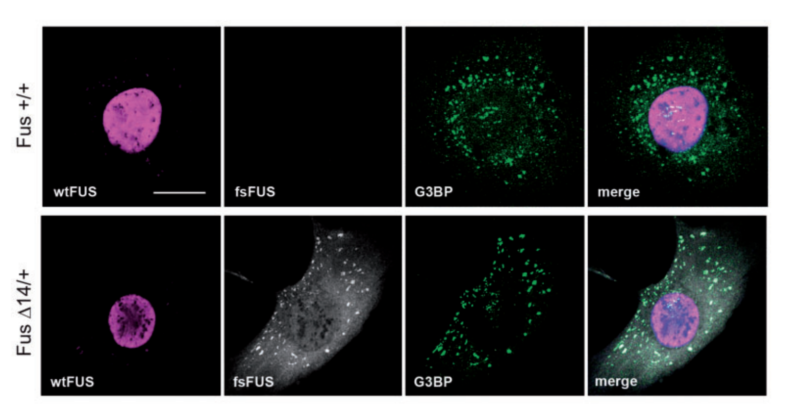 Mutant FUS is mislocalized to the cytoplasm and recruited to stress granules in a mouse model of ALS. 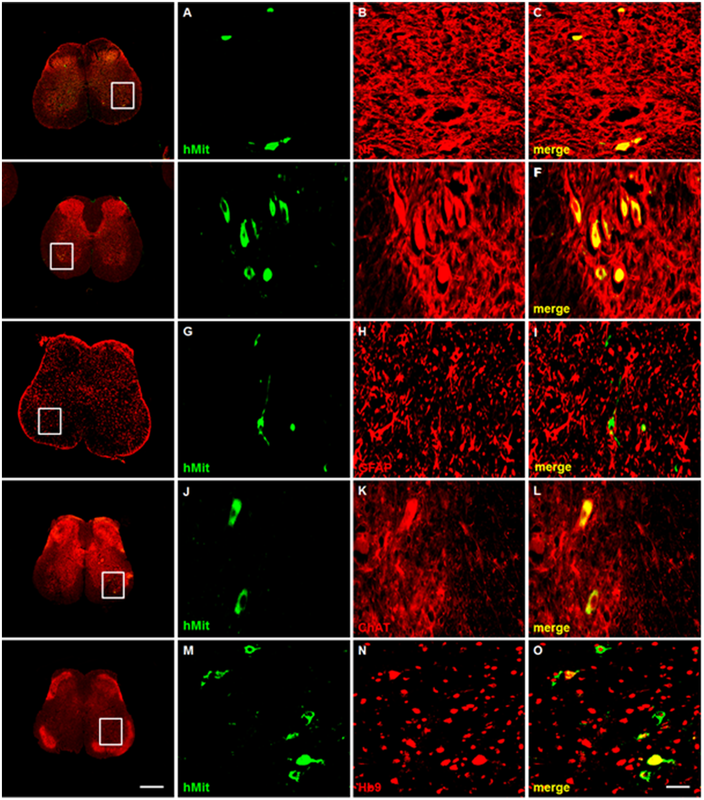 But no inclusions formed suggesting that this mislocalization may underlie motor neuron loss in the disease. [Image: Devoy et al., 2017 under a CC BY 4.0 license]. The mice, harboring an ALS-linked frameshift mutation in exon 14 in one copy of its own FUS gene, develop symptoms at about one year of age. And at 18 months, about 20% of the motor neurons of these mice degenerated – at least in the spinal cord. No FUS aggregates could be detected. The findings build on previous studies, which suggest that motor neuron loss occurs in FUS-linked ALS due to a toxic gain of function mechanism (see February 2016 news; Sharma et al., 2016; Shiihashi et al., 2016; Scekic-Zahirovic et al., 2016; Scekic-Zahirovic et al., 2017). The study is published on November 1 in Brain. The truncated RNA-binding protein, known as “FUSDelta14”, mislocalized to the cytoplasm of motor neurons of these mice. And, according to subsequent analysis, the protein could be increasingly detected at stress granules. This mislocalization may contribute to ALS at least in part, due to the inability of FUS to facilitate the synthesis of key proteins needed to keep neurons connected in the brain and spinal cord (see October 2017 news; Qiu et al., 2014; Yokoi et al., 2017). The model is the first to recapitulate key aspects of adult-onset FUS-linked ALS in mice without overexpression of the disease-linked gene. Scekic-Zahirovic J, Oussini HE, Mersmann S, Drenner K, Wagner M, Sun Y, et al. Motor neuron intrinsic and extrinsic mechanisms contribute to the pathogenesis of FUS-associated amyotrophic lateral sclerosis. Acta Neuropathol 2017; 133: 887–906. [PubMed]. Scekic-Zahirovic J, Sendscheid O, El Oussini H, Jambeau M, Sun Y, Mersmann S, et al. Toxic gain of function from mutant FUS protein is crucial to trigger cell autonomous motor neuron loss. EMBO J 2016; 35: 1077–97. [PubMed]. Sharma A, Lyashchenko AK, Lu L, Nasrabady SE, Elmaleh M, Mendelsohn M, et al. ALS-associated mutant FUS induces selective motor neuron degeneration through toxic gain of function. Nat Commun 2016; 7: 10465. [PubMed]. Shiihashi G, Ito D, Yagi T, Nihei Y, Ebine T, Suzuki N. Mislocated FUS is sufficient for gain-of-toxic-function amyotrophic lateral sclerosis phenotypes in mice. Brain 2016; 139 (Pt 9): 2380–94. [PubMed]. Shang Y, Huang EJ. Mechanisms of FUS mutations in familial amyotrophic lateral sclerosis. Brain Res. 2016 Sep 15;1647:65-78. [PubMed]. Picher-Martel V, Valdmanis PN, Gould PV, Julien JP, Dupré N. From animal models to human disease: a genetic approach for personalized medicine in ALS. Acta Neuropathol Commun. 2016 Jul 11;4(1):70. [PubMed].